Every single one of my mother’s holiday parties always featured this delicious “fancied up” hot apple cider! I recently snagged the recipe from her to serve at one of my own holiday get-togethers with friends. I quickly shared the easy recipe on my Instagram stories and since those disappear after 24 hours, lots of requests came rolling in for the recipe. Here it is! 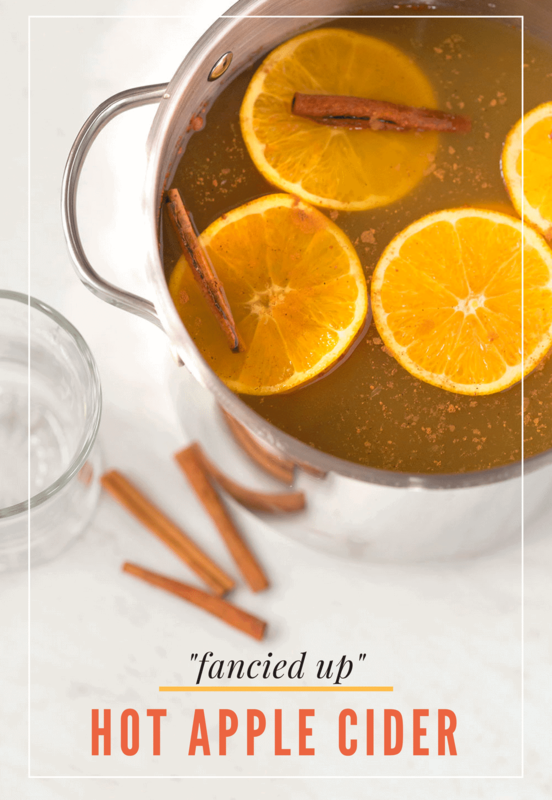 It’s truly the perfect recipe for the holiday season because you can have it simmering on the stove several hours before the party so you not only have the perfect beverage but your house will smell divine. The lemon juice is not a step to skip, take note! The lemon juice helps cut the sweetness of the cider. First things first, don't fret about the cinnamon sticks, cloves, or orange slices. When you scoop the hot cider into glasses, just drain these out (or scoop them out prior to serving). Or garnish your drink with the orange slices and cinnamon sticks! Add all ingredients in a large pot and simmer as long as you need prior to serving! You can add more apple cider if the heat causes it to reduce a bit. *I didn’t have whole cloves on hand so I just used a few dashes of ground cloves. 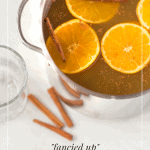 This fancied up hot apple cider is forgiving so add more or less spices, it’s up to you! You can add dark rum or bourbon to this hot apple cider (while simmering) if you want to turn it into the ultimate hot apple cider cocktail! Whatever you fancy, friends! Enjoy it by the fire during this frigid winter or with friends out sledding in the snow. Even if you just make it so your house will smell divine, I won’t judge because that’s what I’m doing right now. Cheers! If you want a different – colder – twist on this, try my sparkling apple cider sangria!